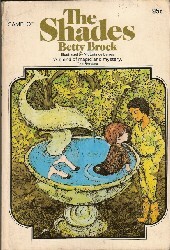 Betty Brock (1923-2003) is the author of several books for young children. She has two grown daughters and lived in Alexandria, VA.
Wallace Tripp has illustrated many books for children, including Come Back, Amelia Bedelia and (one of my favorites) A Great Big Ugly Man Came Up and Tied His Horse to Me: A Book of Nonsense Verse (which he also wrote). He lives in California. 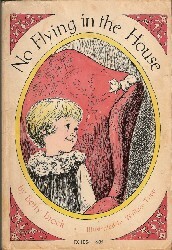 We had a flood of requests for No Flying in the House after solving one of Loganberry's first book stumpers. It was one of those Scholastic Book favorites, originally published in 1970. Now that we know the story, we can recognize it in various long-lost memory requests. Even better, it's back in print in a nice affordable paperback, so order any time! * No Flying in the House. Illustrated by Wallace Tripp. NY: HarperTrophy, 1970, 1982. The Shades. Harper & Row, 1971.